In prior research we have documented how users have little understanding of the actual technical security of web pages and instead mainly rely on what their gut feeling is telling them. It’s therefore recommended that you add visual clues – such as borders, background colors, and site seals – to your online payment forms to increase the perceived security of the sensitive fields in the form in order to make your users feel more comfortable when handing over their credit card information. This recommendation raises an interesting question: which site seals are actually the most trusted by users? Multiple studies exist which test site seals (also known as ‘trust logos’ and ‘SSL badges’), but very few studies – if any – use an adequate sampling size, are of a recent date, and is not sponsored or paid for by one of the site seal vendors. We therefore decided to conduct a survey on site seals with a large sample size (2,510 responses) and of recent date (Jan 9-11, 2013), testing up-to-date versions of 8 of the most popular site seals. Update October 2016: we have published an updated version of this “site seal trust” test at baymard.com/blog/perceived-security-of-payment-form also testing how much users actually trust “fake” seals. 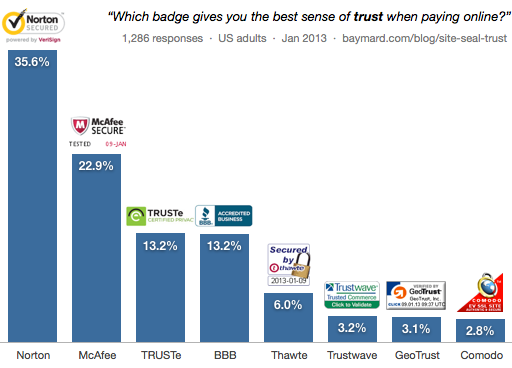 The following site seals were tested and the respondents had to click one of them as an answer to the following question: Which badge gives you the best sense of trust when paying online? The survey received 2,510 responses (1,286 responses on actual seals, the remaining chose “Don’t know or no preference”) and ran from January 9-11th, 2013. All the respondents were adults from the US. The survey was conducted using Google Consumer Surveys. During testing, five answer options were displayed concurrently and their order was randomized to avoid position bias. Each answer was shown an equal amount of times within a +-1.83% margin except for the “Don’t know or no preference” answer which was always displayed and positioned as the fifth and last option. Since we at Baymard primarily focus on checkout usability we wanted the respondents to consider an online payment scenario, and therefore specifically clarified the survey question with “when paying online”. Norton was shown to be the seal which gave customers the best sense of trust when purchasing online with ~36% of the votes. McAfee is a clear second with ~23%. The TRUSTe and BBB Accredited seals are at a tie for the third and fourth place, both with ~13%. Thawte comes in fifth (making it the second best SSL seal). 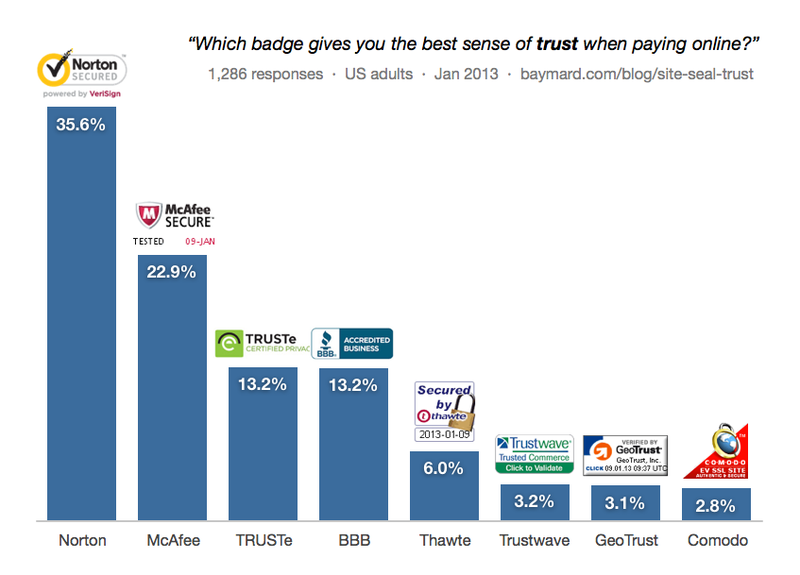 Finally Trustwave, GeoTrust, and Comodo, share 6th, 7th, and 8th place at ~3%. As discussed earlier, it’s not the actual security of your page that matters the most to users as they have little to no technical understanding of TLS/SSL encryption or even how forms are submitted. Rather it is the perceived security that’s of importance to this vast majority of users. This is why we included both SSL seals (Norton, Thawte, Trustwave, Geotrust, Comodo) and trust seals (McAfee, BBB Accredited, TRUSTe) in the survey. What we wanted to test is which site seal makes the user feel the most secure, not which seal actually represents the strictest technical / security compliance. 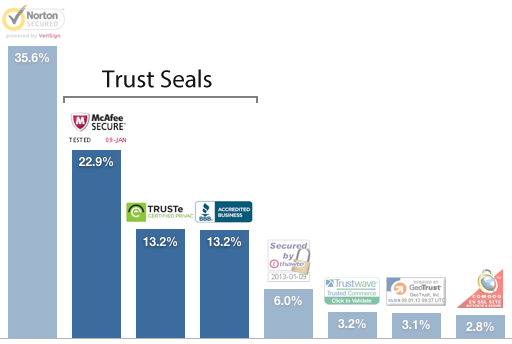 Looking at the results it’s very interesting to see that the second, third, and fourth most trusted site seals are all “trust seals”, whereas the rest are SSL seals, which – with the exception of Norton – all scored rather low. This is noteworthy because SSL seals suggest actual technical security of the payment form (preventing man-in-the-middle attacks and network eavesdropping), whereas the trust seals often don’t indicate any technical security at all but is rather a certification of the company and/or its consumer relations. This again further points in the direction that what matters for the average user is the perceived security, not the actual technical security. Furthermore its noteworthy that the two most trusted site seals, by far, are from anti-virus software brands. It would seem likely that people recognize these brands better and associate them with security, and therefore trust their site seals (which include the company logos) more. So Should I Just Use Norton? It depends. Yes, if you just want a single site seal, although McAfee does not lack that far behind. However, if you want to go all in you may consider investing in three site seals: a Norton SSL seal to indicate an encrypted connection, a McAfee seal to indicate a clean, non-infected “hacker safe” site, and finally either a BBB Accredited or TRUSTe seal for establishing trust in consumer relations. This way you display all of the top 3 most trusted site seals, while at the same time catering to the customers with a high level of technical expertise who actually do know the difference between an encrypted connection, a hacker safe site, and a company with decent consumer relations. The survey did not test whether one or multiple site seals is preferable (this would be an obvious case for doing an A/B test). Also, please note that this is a comparison of the 8 tested site seals, so just because Comodo only scored 2.8%, that doesn’t mean their seal fails to inspire any confidence. Instead, what it means is that Norton’s seal is vastly preferred over Comodo’s. Authored by Christian Holst. Published on January 22, 2013. Forty-nine percent of the survey respondents chose the “Don’t know or no preference” option. The survey had a median response time of 13.6 seconds, which indicates that the respondents at least took the time to review their options and look at the site seals before answering. The respondent doesn’t care about site seals. The respondent genuinely has no preference. The respondent is unable to rationalize a choice (to him/herself) and therefore doesn’t want to pick one. More than half of the Fortune 500 companies within B2C e-commerce have purchased either our checkout research or a checkout audit. This includes Symantec, the parent company of Norton as well as several other smaller companies within the SSL certificate industry. None of these companies have been involved in the making of this survey, or even informed about its existence. The survey was paid for entirely by the Baymard Institute using Google Consumer Survey and thus Google’s respondent recruiting and testing mechanisms. Just curious: how was the sample for your Google Consumer Survey chosen? Is it a pre-existing panel, a pop-up on Google sites or something else? I think there’s another possible reason for the results. As soon as I saw the set of logos, it struck me that Norton, TRUSTe and McAfee were the most simple and ‘clean’ seals and may therefore do well – and these were then the top three. I’d agree that most people either don’t care or have no opinion, but I don’t think you can put the result down to brand awareness without questioning logo clarity. If there’s interest we’d consider doing a followup survey testing various design elements of a seal, including clarity, brand, “fake” logos, etc. That’s a good point. I’m sure the cleanliness of the logos would have some (more noticeable) weight in the decision if none of the brands were recognizable. But most people are completely clueless and when they see a brand they know, it makes a connection in their head. Another factor in this, which would probably be bigger if not for Norton and McAfee’s recognizability, is maybe how often a user has seen that logo before. For me, I know that I would not trust Norton and McAfee more simply because I recognize their names from anti-virus software (and I also am a little biased against them because of the idea of bundled PC bloatware that nags you after 30 days), so I sort of penalized/eliminated them in my head. And I’ve never actually looked into the guidelines for Norton’s, McAfee’s, or any of the other seals, but in my head, I almost wanted to say I’d choose TRUSTe or Comodo because of the (not exactly correct) gut instinct that they must be good if a lot of people use them. How people think they behave and how they actually behave are not the same. People are very poor at predicting behavior. What this survey says is that people know Norton and McAfee brands. Whether those seals will actually positively affect conversions is a complete unknown. It might very well be that Comodo seal or a fake seal will have the same effect on conversions as Norton – this is no information available on this. Yes – as Peep says – recognition doesn’t tell us much about their thinking that happens after that. I get your point on the initial scan visibility, which will always work better with more well known brands. However, it’s the bit after that I’m always interested in. In many cases, actually showing seals near or on critical parts of a checkout process (payment, personal details entry) can have a negative impact. Split testing is the way to go but don’t be surprised if you find the placement, page or step location and contextual wording to be different from what you thought would work logically. Security, Privacy and Trust are complex and subtle things that need careful handling. I know – I’ve borked (and fixed) many pages over time. Testing sure beats my guessing (lol). Craig, as usual, spot on. Absolutely Craig, people should always do A/B tests. Generalized findings such as these can help you figure out what to test. Of course, many people don’t do A/B testing for a myriad of reasons (insufficient traffic, technical barriers, etc). Those people will probably still benefit from generalized findings like these, but we agree that A/B testing is the ideal way to test and verify (re)designs. Of course, A/B testing doesn’t tell us why people act the way they do, and this is where qualitative studies have their merit. Agree with you Craig. The best thing is to carry out test and the impact of conversions by using the trust seals. Do you have any data about impact of conversions using As Seen On Media placements? Interesting hypotheses and directional findings. However, I think your research reflects primarily brand recognition and not actual web user behaviour. It would be significantly more useful (and it would do away with the pesky “49% Don’t Know or No Preference”) if you conducted a statistically valid A/B/n test. Then you would know “for sure” whether or not web users take action given a seal (or no seal, of course). Hi Raquel Hirsch, thanks for your comment. We agree that A/B tests are hugely valuable, but they tend to be very site-specific. There are so many elements in play on any given e-commerce website that are not part of the test yet have a great influence on why your variations perform the way they do. Changing your headers to a blue shade instead of red may sell better on site #1 but the same may not be true for site #2 because of how the blue shade clashes with other elements on the page and diverts the user’s attention to less important elements. A/B test results, especially of elements such as site seals that appear very late in the shopping experience, are therefore not optimal for generalized findings, but the results are of course invaluable to the business itself. We therefore always recommend that you test implementations and use generalized findings such as these as pointers as to what to test. An interesting survey survey and thought-provoking results! so, most of us don’t care about SSL and are vulnerable to frauds. I prefer Norton. Perhaps, another interesting thing to do is to the the same set pf survey questions -worded differently and then see the results. SoGoSurvey has some good samples you can check. Interesting questions and answers/discussions at the comments part. I also have a question of how the survey was displayed? Was there always the same order of above named seals? Or do you have changed the order? As there are about the half of the participants that answered “Don’t Know or No Preference” I strongly suggest that if Norton was displayed on top user just click the first brand they know (“Norton? Oh, I know Norton!” – Click). This behaviour is for me equal to the user that answer with “Don’t Know or No Preference”. Nope. Their order was randomized to avoid position bias. Thanks for the excellent article. I think Norton would be considered a trust seal as well. We use Trustwave for our web application PCI compliance scanning and for our secure certificate and use Norton for their Safe Site program which does daily malware and business verification services. I think the combination of the two is good, although the Norton brand is certainly more widely known than the Trustwave brand. Since the application is multi-tenant, we can extend the benefits across to our clients. I may be mistaken, but i believe you should only be using the Norton Safe site without SSL. If you use SSL with Safe Site, it should be a Symantec SSL. Makes sense to offer a fluid user experience, and the seal and its relevant services are free with the certificate. You are pretty much paying for the certificate already. I think this survey may have a flaw. Norton is number 1 probably b/c it’s a very reputable antivirus. I think sometimes people dont really look at the question carefully and dont want to answer a question as “dont know” especially when the question is “which badge gives you the most sense of trust” Norton is very popular and is know for “security and anti-virus” and thus people will be inclined to select that as the choice, if they dont recognize any of the other answers. I could be wrong, can anyone counter my opinion? I do want to make one point. We know norton is a well known brand and if it is well know and trusted, it most likely is the best choice for a trust seal on your website. Too bad it’s very expensive :( Maybe not the best choice for small ecommerce merchants. The very simple fact that nearly 50% of people said “Dont Know” debunks your idea that people dont want to answer as such. Obviously being a highly visible AV company helps Symantec and McAfee, which supports Baymard’s theory that people care more about perceived security than actual security. Which seals are most popular in Canada. Great article and interesting to learn 50% of the people don’t care which seal. Still it brings up the point that having ANY seal is preferable to not in the consumers mind. It’s definitely true that having a seal is a huge advantage to not having a seal. It makes perfect sense since it’s impossible to just trust random people on the internet. I don’t shop online without some sort of security seal or third-party verification seal. It’s just too sketchy. However, I’m actually really surprised that this study left out Trust Guard’s Trust Seals. They have an excellent reputation as well and provide a great service (at a much better price than any of their competitors). I think the most scary thing is that people do not really care about what is behind the seal. The requirements for obtaining some of these seals are very low compared to what a malicious hacker is capable of. For me it means a lot more if a company e.g. runs a responsible disclosure or bug bounty program, where they are tested daily by the security community. Some examples of this. Hopefully this will be the one and only way in the future to display and communicate security. Nice piece of information. I told my designer to use mcafee and norton for now as we can’t afford anything extra at this point. If we get conversions, surely we would buy more seals. We are evaluating Trust sites for one of our customers, and this article is helpful for us to give them a recommendation. Selecting the top 3 seals seems a good idea. Trust is a big issue for my market, we currently use a few seals and have been looking into adding one more but that would make the total 3 seals. I Feel like that would be to much. These mechanical seals are more cost effective, and in my opinion an improvement over the other seals. Agreed. I’d love to know if anything has changed since the original post. Is there any data or has anyone performed a survey regarding the level of trust associated with enhanced SSL certs that show up next to the browser bar in green with the company name (at least in Chrome)? I personally feel much more comfortable sharing sensitive information such as credit card or bank account information on a site with such a cert rather than just an https:// designation. We’ve recently converted our company websites to these certs and since the premium for these is significant it would be useful to have this information to share. My customers do not care that I do not have a seal.If you treat your shoppers with respect and maintain a good name it pays out. Curious how Google Trusted Store stacks up in this mix. This is a good survey. I hope it is run on a periodic basis. Google Trusted Store is being included in to 2016 update which will be released in our updated version of the “Checkout Usability Report” to be published Q2 2016. This is very interesting Christian thanks for sharing the study. I am curious as to what demographics prefer these seals, I have an inclination that millennials such as myself don’t place too much trust in them. I also agree with Peep and Craig that A/B testing is the only way to discover if these have a place on your site. Maybe it’s time to update this study. There are new players… and some of these aren’t as relevant in today’s online security world. We’re updating it here in 2016, also including some new players. The updated survey will be released in our updated version of the “Checkout Usability Report” to be published Q2 2016. Definately interested in the update on this study, with the moves by Google to promote secure sites within search and all of the privacy news being banded around I am sure this will have had an impact. The privacy elements in the news will no doubt have had an impact on consumer opinion. but will they no proactively look by ssl/trust brand or simply for a green padlock? Predicting users behavior is a difficult thing. Now I think as SSL is one of the ranking factor people are adding site seal. Users does not even notices. After reading this article I contacted Norton to find out more about their services and was surprised to find how much they offer to the consumer. Being someone that does more shopping online rather than in stores, it was eye opening to find that they weren’t just there to let customers know that the site was secure. I’m sure the others offer similar support to customers, but I only spoke to Norton and found out that if a customer buys something from you and sees that the price goes down within a certain time frame, Norton will cover the difference up to a hundred dollars. Their sales pitch on that is that the customer would watch your site for that time period looking for the price to drop and potentially buy more, but I’m not convinced many consumers even know that service exists. They also have an identity theft coverage program that again, I’m sure most people are not aware of. I’ve definitely bought from sites with Norton seals and never knew about the coverage they were offering me. Not sure that this article adds much value. All it really tells us, I think, is that most users are happy enough if they can see the green padlock, but if forced into a choice they go for familiar brands. Norton wins because the design is cool then follows McAfee then the trash! The Norton Secured Seal next to your search listing adds power to your brand and your click-through rates. It’s built right into every Symantec SSL/TLS certificate for added protection against malicious infections.